Resin Filled Surface Pool Lamp is combined by resin filled bulb and frame. The bulb is filled with resin inside, which makes it 100% waterproof, and it supports 16 different kinds of color styles. 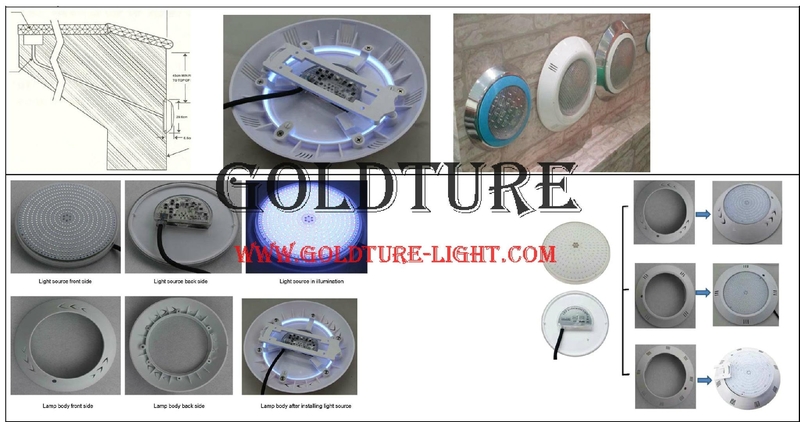 It is designed to replace tranditional PAR56 or LED PAR56. With super slim, good to dispel the heat, never leaking, never break,and easy to install. It has power on/off function, which means it doesn't need any remote controller, but just switching its power off and on, then it will change to next mode to make all lamps in pool synchronous. And it has memory function to memory the color in last time, so it will keep the same color when you connect power on in next time. We offer surface mounted frame in PC and Stainless Steel material, and also embedded niche just the same function as normal PAR56 Poolhousing(niche), but different accessories.